HEE HAW, ON THE COURT. 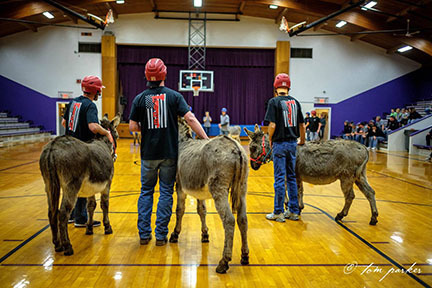 The Blue Rapids and Waterville Fire Department hosted Donkey Basketball, January 29th at seven o'clock at the Blue Rapids gym. Dreamland Donkeys provided the donkeys for the night of entertainment. Four teams were put together, including faculty to play against Alumni and the Waterville Fire Department to play against the Blue Rapids Fire Department. The teams went head to head on the backs of donkeys, pulling any tricks they could to try and get a shot off. Faculty player, Coach Jordan Broxterman, enjoyed his time with his donkey. “ I really liked my donkey, he was pretty chill. I think the emotional connection between the donkey and I was more important than the winning of the game.” A couple conspiracy rumors occurred, suggesting that the donkeys had been trained to stop walking and lay down. “ It was hysterically fun event that I was fortunate enough to be able to participate in.” said faculty player, April Gee. A championship game was played between the Waterville Fire Department and the Alumni, the winning team was the Valley Heights Alumni. “Only in small town Kansas do you see this.” said spectator Jordan Yungeberg, Sr.